Dr. Grandner is Director of the University of Arizona Behavioral Sleep Medicine Clinic. We are part of the Banner University Medical Center. 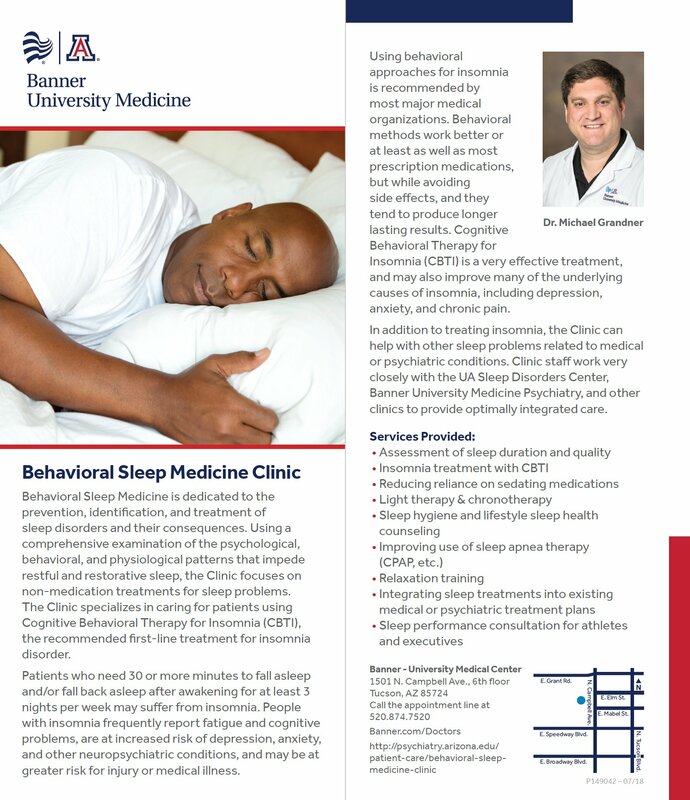 The University of Arizona (UA) Behavioral Sleep Medicine Clinic is dedicated to the identification, treatment and prevention of sleep disorders and their consequences by studying psychological, behavioral, and physiological patterns that impede restful and restorative sleep. We can address sleep disorders, sleep problems that exist as a result of other causes, and the daytime consequences of sleep difficulties. In most cases, we do this without the use of extra medications. Our expert staff includes clinical psychologists, physicians, and other healthcare professionals specially trained to work with sleep difficulties. What is different about Behavioral Sleep Medicine? Behavioral Sleep Medicine is a field that focuses on “behavioral” treatments for sleep disorders. This is different from more traditional medical treatment that usually focuses on medications. For example, in the case of insomnia Behavioral Sleep Medicine treatments are the recommended approach by most major medical organizations because they work as well or better than any prescription sleeping medication but don’t come with the same side effects and also tend to produce more long-lasting effects. We work very closely with the UA Sleep Disorders Center, the UA Outpatient Psychiatry Clinics, and other clinics to provide the best integrative care possible. What sort of patients do you see? People with difficulty falling asleep, staying asleep during the night, and/or resuming sleep when they wake up during the night (insomnia). People who have difficulty with sleep schedules because they have trouble sleeping during their preferred schedule and fall asleep too early or too late (circadian rhythm disorders). People who are using sleeping medications and would like to reduce or stop their sleeping medication use completely. People who travel frequently and wish to minimize jetlag and travel-related sleep problems. People who are receiving treatments for sleep disorders and are having trouble with those treatments. In particular, we see patients with sleep apnea who are struggling to use their Continuous Positive Airway Pressure (CPAP) machines. People who are experiencing sleep problems in the context of depression, anxiety, stress, or other conditions. People who experience recurring nightmares. People who wish to maximize their ability to get good quality sleep. All patients at the Behavioral Sleep Medicine Clinic receive a comprehensive assessment of sleep difficulties and how those difficulties impact on daytime functioning. This includes measurement of sleep duration, timing, quality, and environment, as well as aspects of health and functioning related to sleep quality. We then work with patients to develop a customized, individual plan for each of our patients, based on the unique challenges and problems that they present with. We then develop a personalized treatment plan that ensures that both the patient and provider are on the same page as treatment moves forward. CBTI stands for Cognitive Behavioral Therapy for Insomnia. It consists of a set of tools and approaches for treating insomnia without the use of medications. CBTI is safe and very effective; in fact, it has proven to be as effective or better than any prescription sleeping pill. For this reason, CBTI is recommended as the therapy of choice for insomnia by most major medical organizations. It has proven itself effective in over 20 years’ worth of research studies, including head-to-head comparisons with medications. It also has proven to be effective even if the insomnia exists in the context of depression, chronic pain, anxiety disorders, other medical disorders, and even cancer. In short, it is very effective. But you may not have heard of it – there are still very few people with expertise in this treatment. The way CBTI works is that it understands that whatever the cause of your insomnia, the brain becomes programmed to be awake during the night in bed. No matter how tired you feel, your mind can’t seem to slow down, or your body can’t seem to be able to relax. What CBTI does is essentially re-program your body and your brain for sleep. We can usually do this in just 4-10 sessions. Many people are taking medications or supplements to help them sleep. Often, these are not as effective as expected, or they stop working after a while. Also, they can lead to unpleasant daytime effects. For these reasons, we can help people reduce their sleep medication use over time. Often, people who are used to taking medications to help them sleep are afraid that if they stop taking medications that they will experience severe sleep problems. We work with patients to help them reduce their sleep medication use slowly and gradually, all while improving their sleep without the need for medications. So we can help you reduce your sleep medication use and try to avoid the negative effects. Our biological clocks are extremely important for regulating sleep-wake cycles and many other systems in our body. When these internal rhythms become disrupted, it can cause sleep problems and problems in other areas of health and functioning. Sometimes this can happen as a result of changes in schedules (like jet lag) or with shift work. Sometimes the body’s internal clocks can be out of sync with the external environment (like with extreme night owls) and can cause difficulty with daily life. When these situations present themselves, we can use non-medication approaches such as Light Therapy, which uses specially-designed lights to re-program your biological rhythms. We can also use other circadian rhythm treatments to adjust biological clocks. In today’s society, sometimes maintaining healthy sleep habits can be difficult. We can work with patients to maximize their ability to achieve their optimal sleep. We can help fix problems with sleep regularity and environment, optimally time caffeine intake, etc. We can also work with patients to develop customized plans around including sleep in overall health efforts such as proper nutrition and exercise. Sleep apnea is a common sleep disorder that, if left untreated, can lead to significant complications including heart attack and stroke. The best treatment, CPAP, is often difficult for patients to use on a regular basis. So many people are not getting the full benefits of their treatment. We can work with patients to make CPAP use a regular part of their routine. Many people have a lot of difficulty preparing for sleep and winding down at night. As a society, we tend to confuse relaxation with distraction. Distraction is a passive process and is often unhelpful for sleep. Relaxation, on the other hand, is an active process that helps prepare your mind and body for sleep. Our specially trained providers can help you learn to relax your mind and your body so that you are maximally prepared for rest and sleep. Many people experience irregular sleep patterns or have difficulty identifying the problems with their sleep. We can use cutting-edge sleep assessment technology and complex statistical methods to help patients monitor their sleep-wake cycles to identify patterns and help propose solutions. Our program has experience working with Olympic, professional, and collegiate athletes (as well as members of elite military units). We have also worked with individuals from a wide range of industries. Let us use this experience to help you maximize your health, decision-making, mental performance, and physical performance by maximizing your sleep. We can work with your other treatment providers to manage your treatments for a wide range of problems. Since sleep problems are common in many medical and psychiatric disorders, we can work with your other providers to best integrate sleep health management plans into your existing care. The Behavioral Health programs at Banner participate in most (but not all) health insurance plans. The most common plans seen in the clinic are Medicare and Blue Cross Blue Shield, and both are supported by our program. We also participate in dozens of other medical plans. Most plans will require a co-payment for a visit to the clinic, and some may require prior authorization. To schedule an appointment, just call the Appointment Line at (520) 626-7664 and mention this clinic. 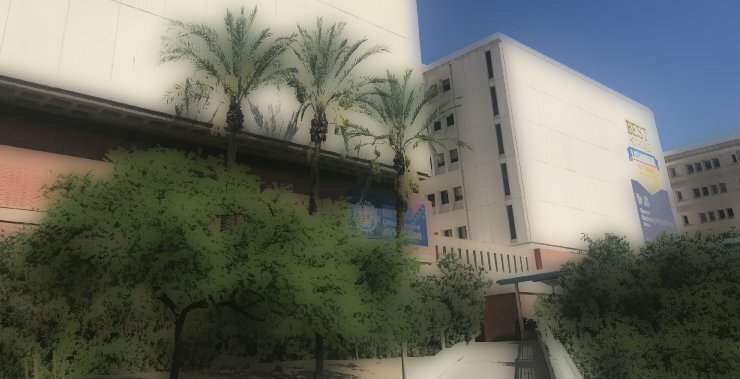 We are located on the 7th floor of the Banner-University Medical Center Tucson. I scheduled an appointment - now what? It would be very helpful for you to bring copies of any relevant sleep-related medical records, especially if they were from a source outside of Banner. We can scan them and include them into your file. Also, make sure you have a complete list of all the medications and supplements you are taking. For your initial evaluation, we will ask that you arrive 30 minutes early. After you check in for your first appointment, you will be given an electronic tablet to complete a set of questionnaires and surveys for you to complete. These will gather information about your sleep habits and ways that sleep may be impacting your daytime functioning. The information will be used to guide the development of your individualized treatment plan. If you need any help completing these surveys, we can provide any assistance you need. After you complete the electronic questionnaires, you will have an initial visit with one of our doctors. You will spend about 1 hour with them, going over your sleep issues in detail. This information will be used to help develop your personalized treatment plan. Please plan time accordingly.